Visually engage Guests to help them better understand and remember your message. Most people fear standing in front of people to give a presentation but are completely comfortable and confident in an online meeting environment using Present Slides. This is a reliable, low-bandwidth tool that allows you to show, annotate and use a pointer on a PowerPoint, PDF and Word Doc presentations in your live web meetings. This tool uses a fraction of the bandwidth required by other services. Slides and annotations are perfectly synchronized on mobile devices. When you upload a PowerPoint, PDF or Word Doc, the slides and pages are converted into images which you can navigate through, use a pointer tool and annotation pen to draw attention and keep attendees engaged in the meeting. Present Slides has been proven to help people better understand and remember the message and content being presented. 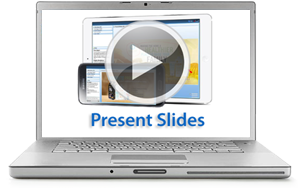 Administrators and compliance officers can easily add, remove and update the Present Slides content of their client meeting rooms with company-approved presentation materials. View the Present Slides tutorial.